On the kitchen windowsill you can sow sprouting seeds - or 'microgreen' baby salads. 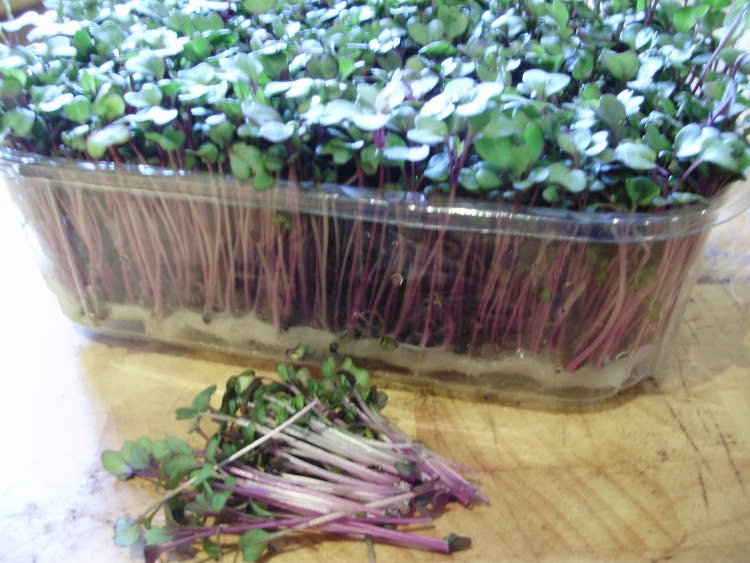 They're nutritious and easy to grow in small trays of organic compost or paper towels - just as we all used to grow mustard and cress as children. Seeds such as sunflower, red amaranth, beetroot, basil, broccoli, kale, radish and of course mustard and cress etc. are all suitable and can be started now may be ready for Christmas salads and garnishes. Sprouting seeds in jars is also easy to do, and spouted seeds can be a highly nutritious and healthy addition to winter salads. Make sure you rinse them thoroughly and regularly though, if you do them in jars in a warm place - preferably rinse them 2/3 times a day, with filtered water, to avoid bacteria or disease building-up. 'St. Stephen's' - or 'Boxing Day' has always been the traditional day for sowing giant exhibition onions and pot leeks - if you're into those! I prefer mine a bit smaller and tastier! Although it's a very neat way to avoid any washing up perhaps - and cold turkey might be a bit more appealing after an hour or two outside! If you're absolutely desperate to sow something this month and have a greenhouse or tunnel with a heated mat or propagator that provides very gentle bottom heat - no more than 50 deg F/10 deg C - then you could in theory sow suitable types of winter lettuces like 'Winter Gem Vaila' (little gem type) and 'Rosetta' - (a reliable indoor winter butter head) Seed of these F1 hybrids is very expensive and you don't get many in a packet - so sowing individually into modules is definitely the safest, most cost-effective method. Sowing individually in modules also gives seedlings better air circulation, avoids any damage from 'pricking out' seedlings causing possible 'damping off disease'. Having larger plants in modules for planting later also reduces the risk of slug damage. Frankly though, the light levels are so poor now that it's really not worth risking expensive F1 seed! - Those sown in another month or so will easily catch up, be much healthier and far more sturdy, because light levels will be higher. Commercial growers would obviously give these seedlings artificial light and heat - but I don't think that any lettuce grown with so much artificial heat and light is worth the resulting climate changing greenhouse gas emissions - particularly if we get a sudden very cold spell. You could try a few cheap lettuce, oriental salad mixes or other salad leaves like rocket if you want to, or even broad beans or peas in pots if you haven't done any yet - germinating inside in gentle warmth initially and then putting them out into the light as soon as they've appeared. Realistically though, you're not really going to gain very much if anything at all by sowing right now - wait until the very end of the month or early January 2019 - then plants they stand a far better chance of successfully growing on and being healthy and productive. Most things are barely 'ticking over' right now. In another month - with light levels increasing they will start to grow far better even though it'- will still be cold. Far better instead to spend your time instead making a really good cropping plan, comparing the catalogues, ordering seeds and seed potatoes. Popular varieties always sell out quickly. Sorting pots and seed trays into sizes and cleaning them is also a great job you can do now to be prepared for seed sowing later. You can sow any perennial tree or shrub seeds that may require stratification (frost exposure) in cold weather outside. Many hardy seeds need a really cold spell to germinate. Some will germinate surprisingly quickly. Make sure you protect them well from any hungry rodents! It's well worth trying trees and shrubs from seed - many germinate far better from fresh seed than they will from any you can ever buy from catalogues. Garlic cloves can still be sown/planted now both outside and also in tunnels, greenhouses or cold frames, for a really early crop of big bulbs next year - most varieties need some cold weather for good root development. Thermidrome and Cristo are my varieties of choice to plant before the New Year - both are strong-flavoured. The only one I've ever grown really successfully from a spring planting though, is 'Cristo'. Choose firm, plump and healthy outside cloves from this year's crop, or buy certified virus-free ones from garden centres. Do not use supermarket bought bulbs which will most likely be unsuitable for this climate or may even carry in diseases like onion white rot. This can survive in the soil for up to 20 years and be spread around the garden on your boots! For the same reason I don't use onion sets outside in the garden at all. If you want some extra early onions - then grow some sets in pots or containers. That way they'll be even earlier than they would be if grown in the ground and if you're unlucky enough to get any diseases you can just throw the compost into the food/green waste recycling bin - rather than spreading it around the garden! I grow all my onions from seed sown in early March - this avoids the possibility of onion white rot. There is some evidence now which suggests that garlic may gradually adjust to local climates - so if you find one when you're on holiday that you like and fancy growing it - then plant it in a pot the first year to make absolutely sure it's healthy - and later on plant it out in the garden. Always make sure it has really healthy looking green leaves - not yellow and stunted, twisted or yellow spotted which would indicate virus infection. Similarly, if you see any evidence of disease or virus on any bought in garlic or onion sets pull them up immediately and dispose of in the bin - not onto your compost heap! St. Stephen's Day was also when many of the old gardeners used to plant their shallots. I prefer to wait a couple of months because onion white rot is encouraged by low soil temperatures combined with wet weather, and if I'm buying in shallots sets I want to minimize that risk as far as possible. They can also be started off in pots just like garlic, planting out later for extra big clumps at harvest time, or grown on in containers. The seed catalogues are arriving through the letterbox now - I read them eagerly by the fire in the evenings. Although I prefer a catalogue that I can have in my hand - the choice available online is almost limitless now. Some serious self-control and realism is needed to curb my wildly over-optimistic 'plantaholic' tendencies! They're all just so tempting that moderation is extremely difficult! I discovered a website actually selling 600 varieties of tomatoes 2 years ago - OMG! I left the site after about 15 minutes of painfully groaning...."I want that one - and that one - and that one"! Hard to believe that I swore 6 years ago that I never, ever wanted to grow tomatoes again (or at least not for a very long time) after growing almost 50 varieties for the Tomato Festival in the difficult 'summer' of 2012! Then having to cook all of them afterwards for the freezer - I'd really had enough of them by that stage! But the problem is, there's always that enticing possibility that I might just find an even better one!...... A bit like childbirth I suppose ...... it's amazing how quickly one forgets!! But seriously - do get your seed orders done early now - before Christmas. Growing your own has never been more popular and the best varieties - or those recommended in magazines - not always the best varieties - but often those the seed companies want to push - will sell out quickly. You may have your own favourites that do well in your particular local climate and conditions. Although each year I try a few new things, or new variations of old favourites that look as if they may be promising - as a rule I generally only recommend varieties that I've grown successfully for at least 3 years, as that generally gives me a good idea of how they'll perform. So many of the seed companies and garden writers who review the catalogues live in the south of the UK - where temperatures and conditions there are normally very different to here in Ireland! Prices tend to vary a lot too - some varieties can vary by as much as €2 a packet - so it's worth doing comparisons and shopping around! You'll kick yourself if you order something and then discover it's far cheaper somewhere else! It's surprising how costs mount up when you're doing a big seed order. Sharing an order with friends is a good idea too - since seed companies often put far too much seed in the packets sold for amateur gardeners - who on earth needs between 200-400 seeds of celery for instance? Or 300 cape gooseberry seeds! Couldn't they just reduce the price? Particularly so, since seed of some things like celery, carrots, parsnips etc, don't keep for very long - losing their viability very quickly once opened. If you're on holiday in Europe - it's worth seeking out a garden centre and looking at the seeds available there. A few years ago on my last holiday abroad (I only have a 'fly to' one every 10 or so years - hard to justify the carbon!) I found seeds incredibly cheap - just €1 for massive 'grower'-sized packets! Make sure they're varieties you recognise though - or said to be early-maturing ones, as some may need a much warmer climate then ours in northern Europe. Not worth wasting space for a whole season on something that produces too late to ripen, or to crop well - if it crops at all. I really enjoy sharing my original ideas and experience of growing and cooking my own organic food with you. It's very satisfying and also most complimentary if others find "inspiration" in my work. But if you do happen to copy it, or repeat it in any way online - I would appreciate it very much if you would mention that it originally came from me. Thank you.